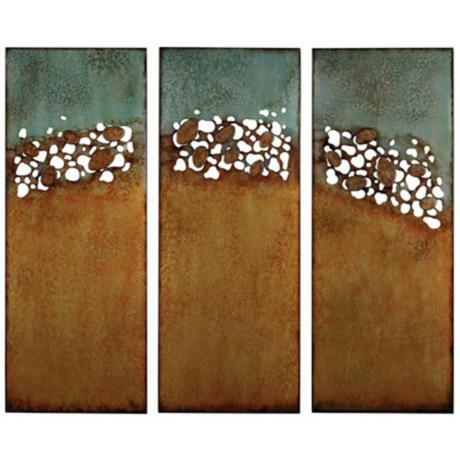 Laser cutting creates an intriguing effect in this turquoise and brown metal wall art. 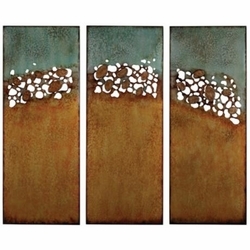 This set of three wall art panels makes an abstract reference to earth and sky. Turquoise and gold paint are glazed with an antique high gloss finish for depth and richness. Laser cutting into the metal panels creates texture and contrast. An exquisite choice for any living space.Create elegance and stunning drama on your walls! • Abstract blue and brown theme. • Brown antique high gloss finish.